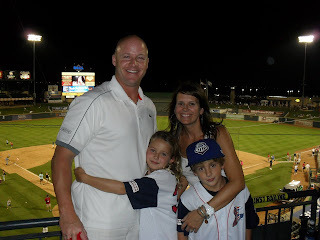 Round Rock Express baseball fun! Mark took his team to Austin/Round Rock Texas to celebrate the Labor Day Weekend! Check out a game if you're ever in the area....top notch organization. Also went to Gueros and enjoyed a little tex-mex on Congress St in Austin. Junie thought it was fabulous and loved the outdoor seating. Hope your weekend was fun and labor free! Glad it was fun! Still not used to you running around with my hair color!!! :) Lookin' good!